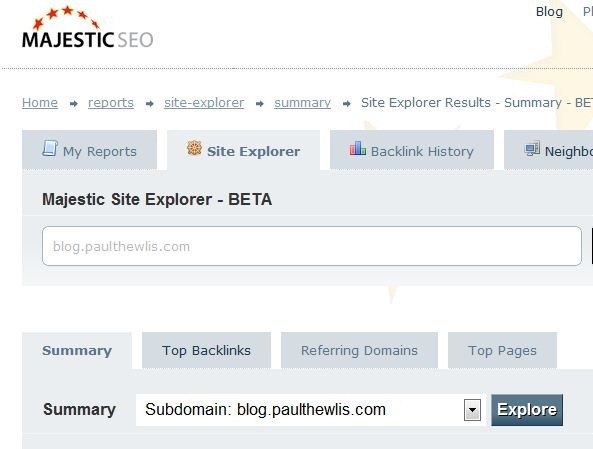 I’ve been taking a look at Majestic SEO’s new Site Explorer tool. First impressions are good, and it seems like a worthy rival to Open Site Explorer from SEOMoz. The summary page is nicely laid out giving a quick overview of backlinks to the domain you’re analysing. You can also drill down to view Top Backlinks, Referring Domains and Top Pages. There’s probably not quite as much information available as there is in the SEOMoz offering, but Majestic also offer free backlink reports for domains that you control. Both companies offer paid-for options that give you access to more link data than you can see in the free versions. Majestic’s subscriptions start at £29.95 (GBP) compared to $99 (USD) at SEOMoz. These tools are extremely useful for in-depth backlink analysis. Since Yahoo! Site Explorer closed its API service in December 2010, many SEO pros who have grown to love the Yahoo! tool, are fearful its days are numbered. So it’s good to see other developers stepping up to fill this potential whole in the market. You can read more about Majestic’s Site Explorer on their blog.